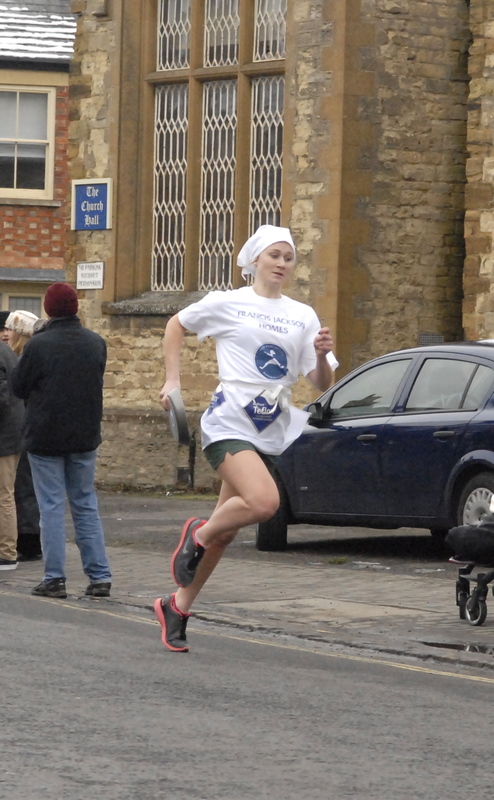 Olney Pancake Race – Page 4 – On Shrove Tuesday every year the ladies of Olney, Buckinghamshire compete in the world famous Pancake Race, an Olney tradition which dates back to 1445. The 2020 race will be held on Tuesday 25th February. The race starts at 11:55am. Children from Olney schools also take part in their own races. Since 1950 Olney has competed against the women of Liberal, Kansas, USA in an international race. 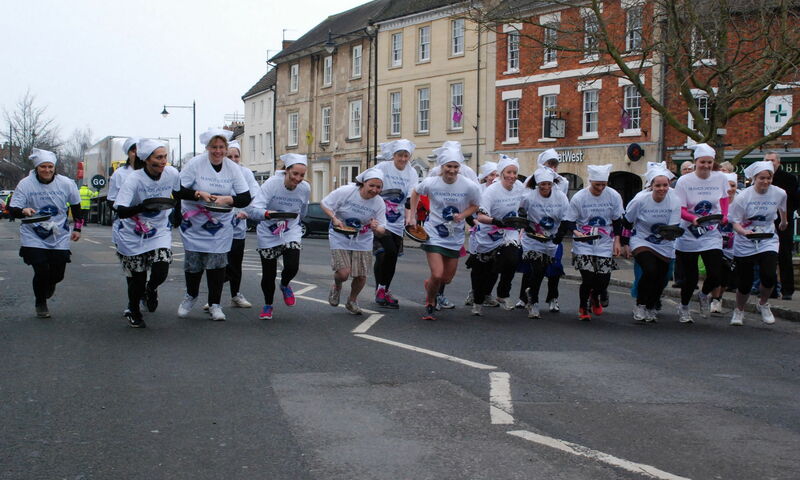 Olney ladies, entry forms are now available for colletion from Natwest Bank in Olney. Only 25 places so hurry, hurry, hurry! 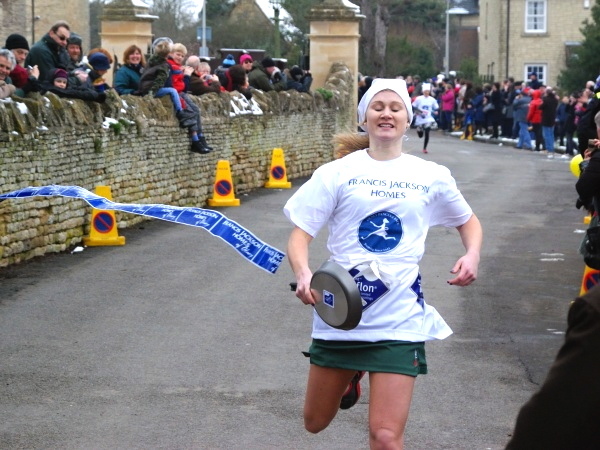 Devon Byrne, 19, not only won the Pancake Race in Olney but she also set a new world record, with a time of 56 seconds. Devon broke the previous record of 57.5 set by Tasha Gallegos of Liberal in 2009. Devon also won the 2013 International title in today’s match between Liberal, Kansas, and Olney, England, for the second year in a row. Devon’s mother Lesley was a three-time Olney race winner in 1988, 1989, and 1993. Devon set an incredible pace and was ahead by some way from very early in the race. Devon flying through the finish line. Devon receives a kiss from the Verger for winning the race. Celebrity Chef, Lesley Waters, was there at the finish to congratulate Devon on her win. To make the sauce place a small heavy pan over the heat add the sugar, butter and cream and whisk until heated through. Stir in the nuts and set to one side. Sift the flour and baking powder into a bowl stir in the sugar. In a separate bowl or jug mix together the eggs and milk, then add to the flour mix to make a smooth batter. Briefly fold through the blueberries. Heat a little oil or butter in a large non-stick frying pan and spoon the mixture allowing it to spread to about 8cm in diameter, fry the mixture in batches of three. Reduce the heat and cook for about approx 1 ½ minutes until small bubbles appear on the surface then carefully flip over and cook for a further minute or two until golden. Flip onto a plate and keep warm in a low oven while you cook the rest. Serve piled up drizzled with sauce. Serve with extra blueberries and ice cream. 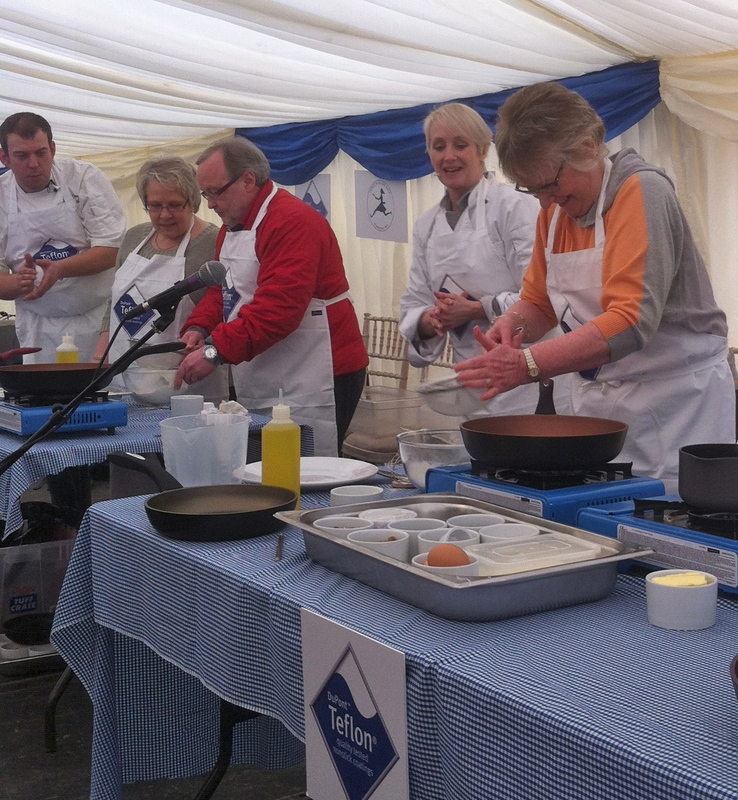 Come and see the Children’s Races on Pancake Day. 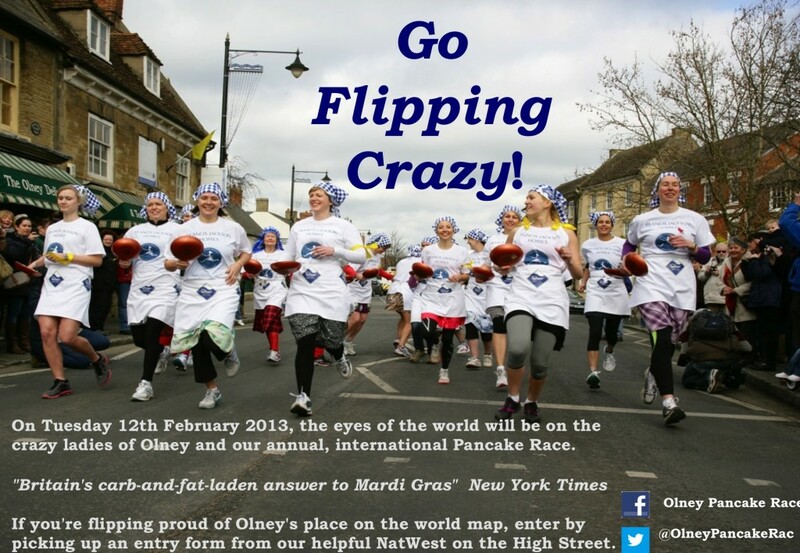 Olney ladies – the Olney Pancake Race is less than a month away. 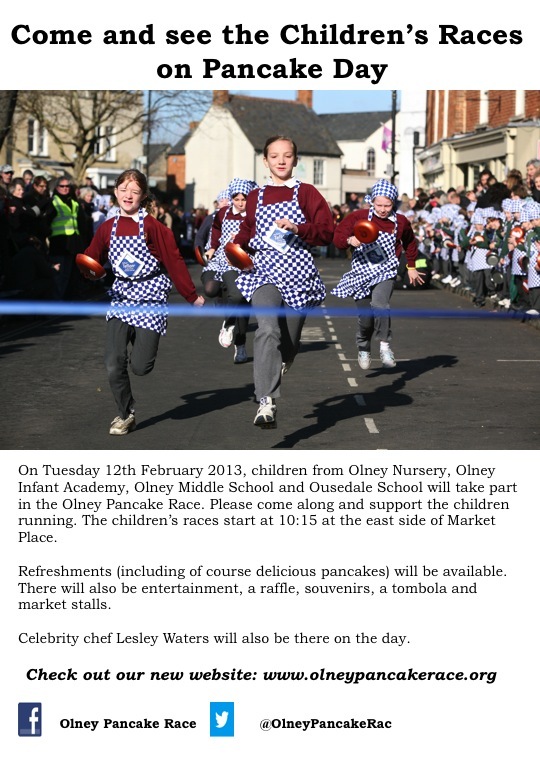 The Olney Pancake race will be held on Tuesday 12th February 2013 which is less than a month away. Women who have lived in Olney for more than three months prior to the race can enter. 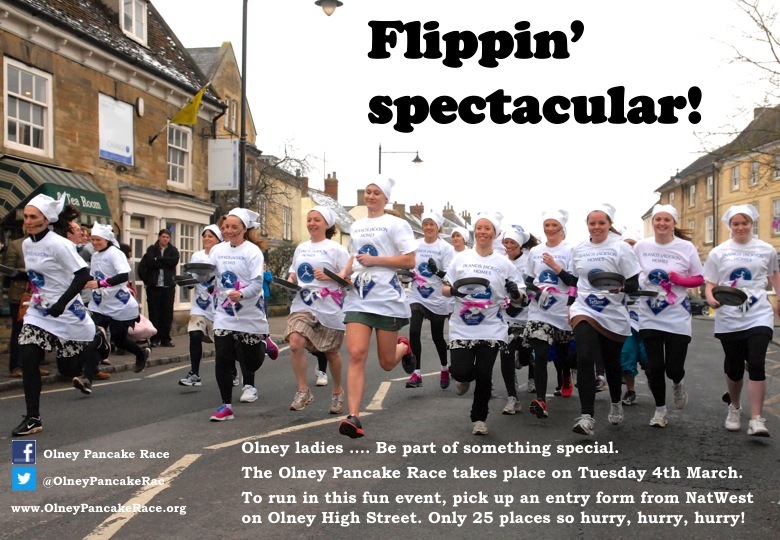 The race is limited to 25 women so if you are a local lady who would like to take part in this wonderful tradition, please collect your entry form from the Natwest branch on Olney High Street as soon as possible. The forms need to be returned by 7th February at the latest. Whether you are in it to win it, or would like to take part to raise money for your chosen charity, please consider entering.